George Ella Lyon is my favorite children’s author, and in “Weaving the Rainbow” she almost hides a riddle. She describes sheep in a pasture, and follows them through the seasons. They lead ordinary sheep lives, “But they were getting closer to the rainbow,” Lyon writes. The next page describes fall, and it features colorful leaves. But it’s only on the final page that the real rainbow is revealed. It’s another children’s book with lavish watercolor illustrations. Even on the book’s inside cover, there’s four shades of green in a spectacular field, plus a white picket fence and blue skies in the distance. “The weaver” looks proudly on the sheep in her pasture. And fall brings red leaves – and shaggy fur for the sheep. But it’s easy to see how the illustrator was inspired by Lyons’ text. “It is spring now. It is shearing time,” she writes simply – but those words suggest rich illustrations. And when the sheep were born, their coats were white, Lyon writes. They’re turned out into “April fields”, and they even win ribbons at the state fair. 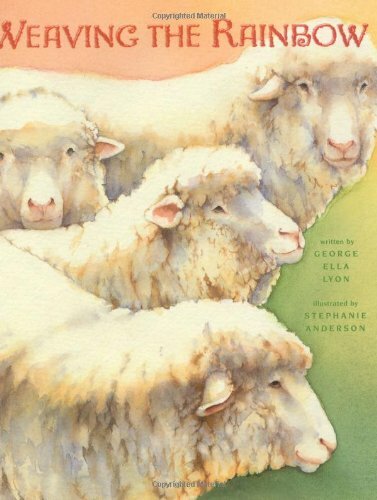 The sheep’s lives pass by quickly, because the book is not about the sheep – it’s about their wool! She’s “doing with wool what a painter does with paint,” Lyon adds wisely. In a wonderful irony, the artist weaves little lambs into her tapestry – using the white wool that she’d sheared from real lambs. Only then can the reader understand the strange drawing on the book’s copyright page. It’s another view of the field from the book’s inside cover – now including sheep. But as the drawing moves to the page’s right side, the drawing suddenly starts to fade into a faint grid. At the end of the, its meaning is clear: it represents the crisscrossed crocheting in the weaver’s final tapestry. It’s a very moving story about a family affected by war, told from a child’s simpler viewpoint. And it’s the illustrations that make it seem even more real, with bright watercolors suggesting a sunny childhood day, while the child report’s on the day’s events matter of factly. She goes to the beach with her brother, where they see black specks on the horizon. “Are those birds?” asks the girl. But they’re not. They’re ships, “taking soldiers across the sea to war,” her brother tells her. 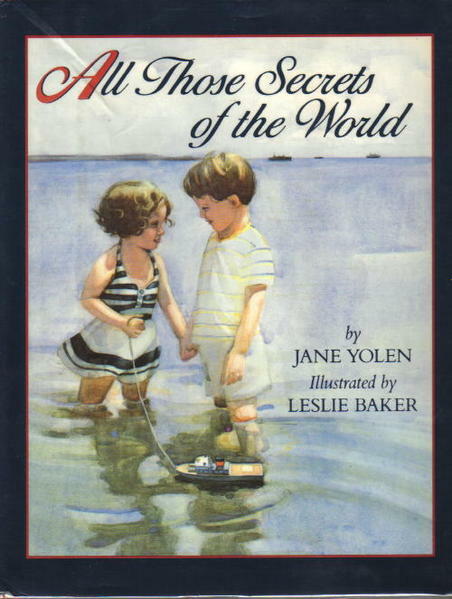 And the illustration shows their innocence in the moment, with the two children wading at the edge of a vast ocean under white clouds, with the ships just visible on the horizon. They couldn’t be ships, the girl insists. “Those specks are no bigger than my thumb.” And the brother demonstrates that things look smaller when they’re futher away. “‘Come back, come back,’ I cried, suddenly afraid he’d disappear forever like the ships gone from the horizon, dropped over the edge of the world…” And both children get in trouble, because they weren’t supposed to wade in the ocean. And he kisses and hugs her again, until it all seems familiar again, and war seems like a distant secret that belongs to the outside world.